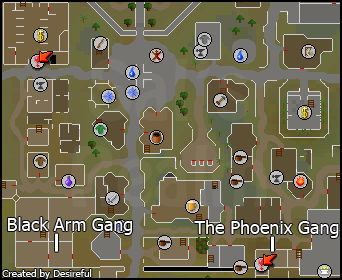 The Black Arm Gang and the Phoenix Gang are two separate gangs of thieves. Each Gang stole one half of the Shield of Arrav, but you and a friend can re-claim the shield during the Shield of Arrav quest. Each Hideout is hidden in the huge city of Varrock, making them hard to find, but in this guide you will learn on how to get there and all about the different things that go on in these hideouts. First of all, you will learn all about the Black Arm Gang Hideout, who is run by Katrine. 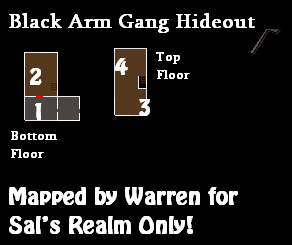 To get to the Black Arm Gang Hideout, follow the Red Route as shown on the map above. Katrine is the Gang leader of the Black Arm Gang. She is used in two quests; Shield of Arrav and Heroes' Quest. In Shield of Arrav you will have to get her permission to join her Gang, she will give you a task to make sure you are worthy of joining. If you manage to join the Gang, during Heroes Quest you will have to talk to her on how to acquire a Master Thieve's Armband. In the hideout there are some Level 16 Thieves that you can train on. They have 160 Life Points but are not commonly trained on. They drop items such as Runes, Arrows, Coins and sometimes you may find a Level 1 Clue Scroll! You may be wondering 'What's so special about a Cupboard?' 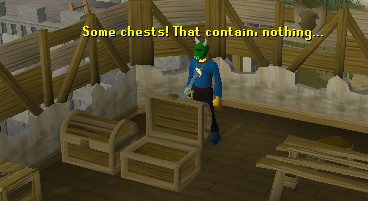 Well, this Cupboard contains one half of the Legendary Shield of Arrav! 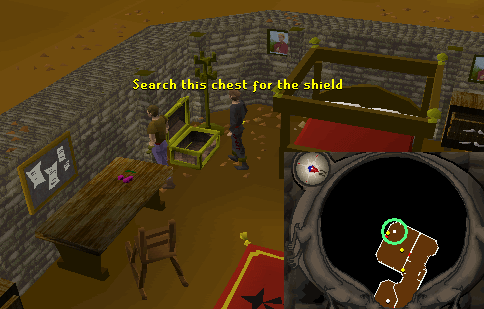 If you get your friend in the Phoenix Gang to get the other half of the shield, you can take them to the Curator at Varrock Museum who will give you two certificates (one for you, and one for your friend), which you can take to King Roald in Varrock Palace. This is proof that you recovered the Shield of Arrav. In the north of the building, on the second floor there is some wooden chests with gold trim! They look pretty, shall we have a look inside? Is there any Money in there? No, there's nothing. This concludes our tour of the Black Arm Gang! Now that you have learned all about the Black Arm Gang, let us move on to the Phoenix Gang Hideout, who is run by Straven. 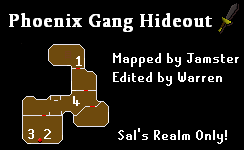 To get to the Phoenix Gang Hideout, follow the Blue Route on the map above. At the end of the Route you will reach a ladder. 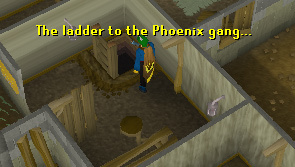 Climb down it and you will find yourself at the Entrance of the Phoenix Gang Hideout. He is the leader of the Phoenix Gang. Much like Katrine, he is used in the same two quests; Shield of Arrav and Heroes Quest. In Shield of Arrav you have the chance to join his gang, but you will have to complete the task he sets. If you are in his gang and you are doing Heroes Quest, you will have to speak to him if you are going to acquire the Master Thieve's Armband. The Phoenix Gang has their own private Weapons Storage! The entrance of the weapon storage is near the entrance to the Temple of Zamorak. To access it you must have the 'Key' (which you can obtain from Straven or other players). To get the key from Straven you have to be in his Gang. Before you pick these items up, you have to kill the level 23 Weaponmaster. If you try to pick up the weapons when the Weaponmaster is around, he will automatically attack you. 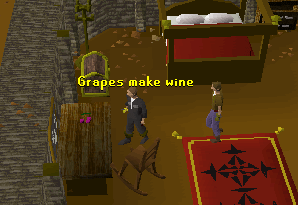 You can pick up a bunch of grapes while you are in the Hideout. You could make a jug of wine with these! First add the grapes to a Jug of Water and you will get some unfermented wine. Wait (by storing it in your bank or keeping it in your inventory) and soon it will be fermented and you will be able to drink it! Near the table with the grapes on, there is a wooden chest with gold trim on it. Inside the chest is the other half of the Legendary Shield of Arrav. Take this and the other half of the shield to the Curator, (in Varrock Museum) to receive two certificates. Give one to your friend that helped you do the quest, and take your certificate to King Roald in Varrock Palace, to complete the quest 'Shield of Arrav' and collect your 600gp reward. Much like the Black Arm Gang Hideout, this hideout contains some Level 16 Thieves! They have exactly the same amount of Life Points (160) and the same drops as the Thieves in the Black Arm Gang Hideout. These are labeled 4 on the map, they do not stay in that place though, they tend to walk about. Black Arm Gang: Talk to the Tramp in Varrock. Phoenix Gang: Talk to Reldo in the Varrock Palace.